The varieties of forms needed to open a restaurant business are numerous and will depend on when it will be used and what the purpose of the document is. Nonetheless, every restaurant owner must have all the recommended documents ranging from restaurant finance paperwork up to the restaurant menu forms to be presented to the clients. Additionally, a restaurant must also assure that they have the specific restaurant forms that certify their responsibilities to keep their clients’ health secured and safe. One of the most common restaurant forms that focus on the safety of the food and clients is known as a restaurant waste form. What Is a Restaurant Waste Form? A restaurant waste form is a document that determines the waste disposal, maintenance, and the cleanliness of a restaurant establishment. This form is also a universal category that has various documents that list the waste management strategy of a restaurant, as well as distinguish if the restaurant has complied with the food safety regulation of a state. After completing a restaurant waste form, the restaurant owner must keep a duplicate copy of the document and submit the original form to the authorized personnel. You may also see food evaluation forms. 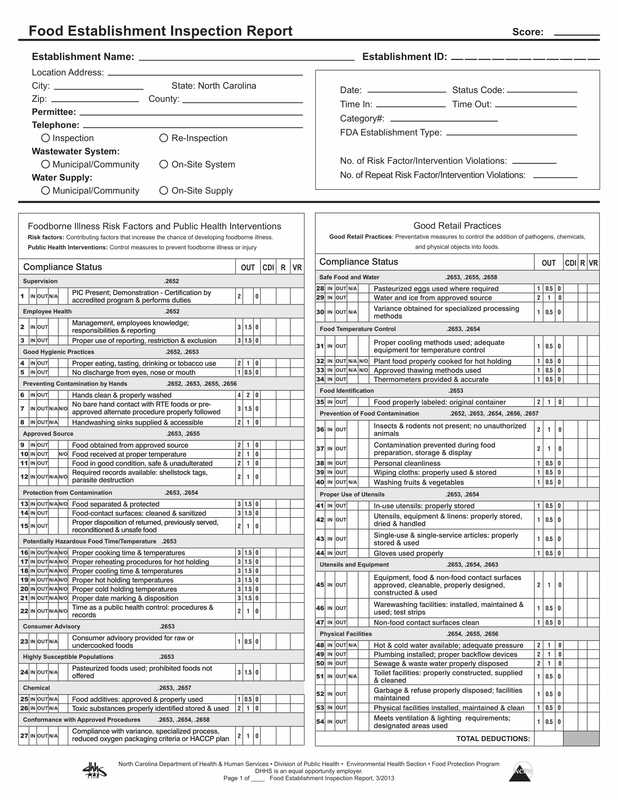 This form is a checklist document that allows a restaurant business owner to determine if the appropriate steps toward waste reduction have been taken by the management. 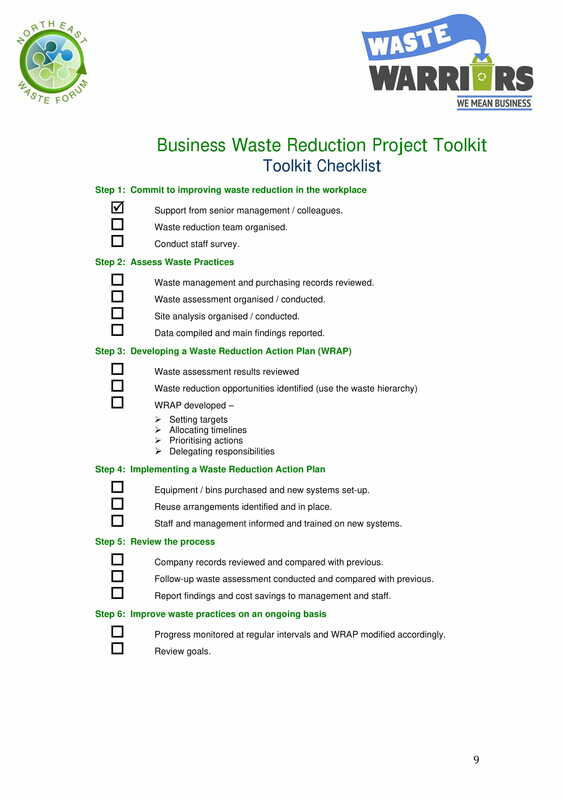 The steps listed in the form includes the acknowledgment phase, which refers to committing and accepting the responsibility of reducing waste, which will then be followed by a detailed waste practice assessment. Then, an action plan should be developed which will lead to an implementation of the new regulations to improve the business’s waste management process. With the form, the authorities will be able to conduct a restaurant performance survey to distinguish which restaurant establishments have failed to implement and mandate proper waste reduction. It is significant that restaurant owners along with their business partners will include waste discharge assessments in their restaurant business plans to assure that they are meeting the guidelines of the state and that they will be able to list the companies who will be collecting their wastes on a regular basis. Additionally, the restaurant must also prepare a food services waste discharge assessment form to be used during their assessment period. 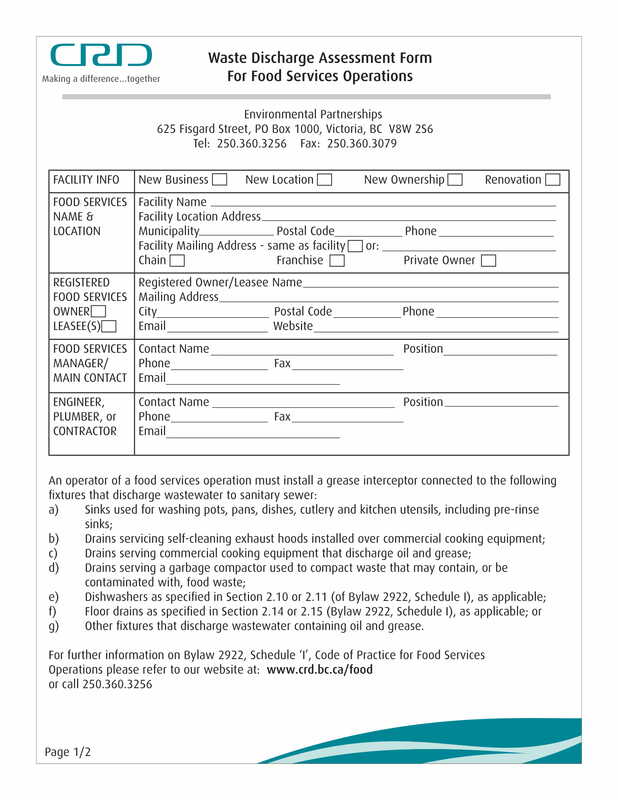 This form contains the general information of the establishment including its facilities, staff, types of services, and the name of the plumber and contractor who will aid in the waste maintenance of the restaurant. Not only are the general restaurant employees the individuals who need to maintain cleanliness in the kitchen but also those who are the staff in an educational institution’s canteen. The form will indicate the name of the school where the assessment is being conducted, the contact information of the school, as well as the date of the assessment. The number of people in the school campus or the school’s population is also determined on the form into categories such as the number of faculty members, students, and the varying grade levels in each department of the school. 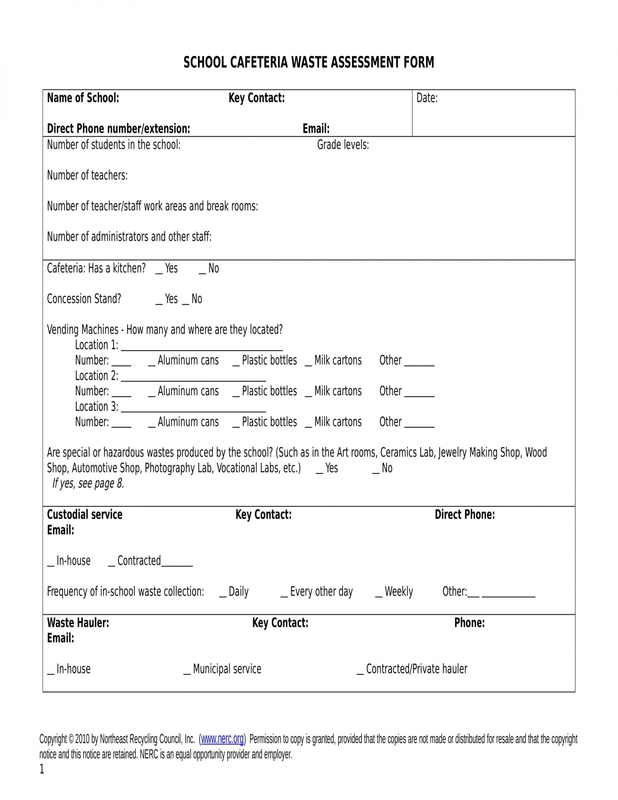 The main content of the form centers on disclosing the data regarding the school’s vending machines, canteens, and hazardous waste. Additionally, the identifications of the custodial service providers and the waste haulers are also stated to allow the authority and the school in calling them whenever their services are required. 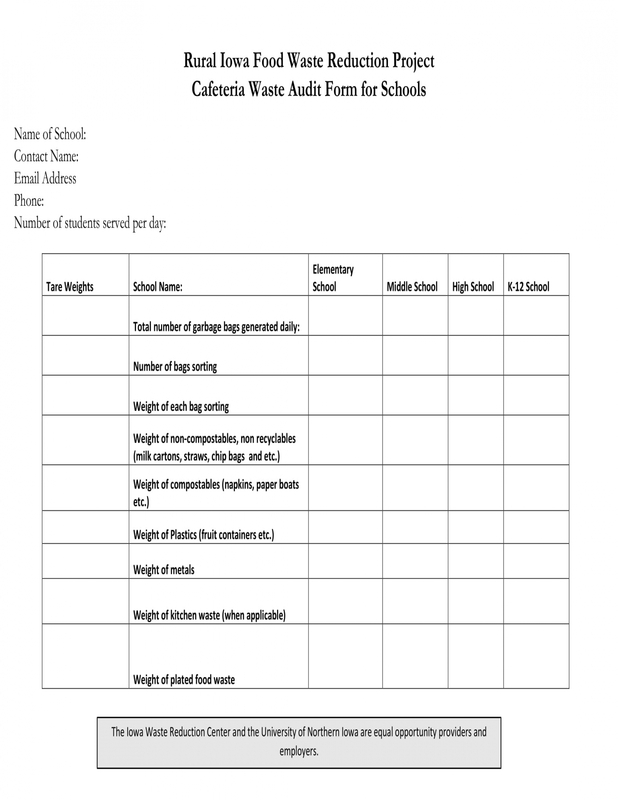 Other information found on the form includes the estimation of the school’s monthly waste generation, cafeteria information, the current waste management costs, the school’s recycling and composting efforts, and the recommendations of the school’s faculty members. Some restaurant business owners value the importance of new projects which will be mandated within a certain period for the improvement of the restaurant. These projects are then compiled along with the restaurant plan documents in order to achieve sufficient details about its relevance to the plans that will be made in the establishment. However, aside from the ideas of the owner, budgeting and audit forms should also be considered for the restaurant wherein one of the least common documents is known as a food waste reduction project audit form. 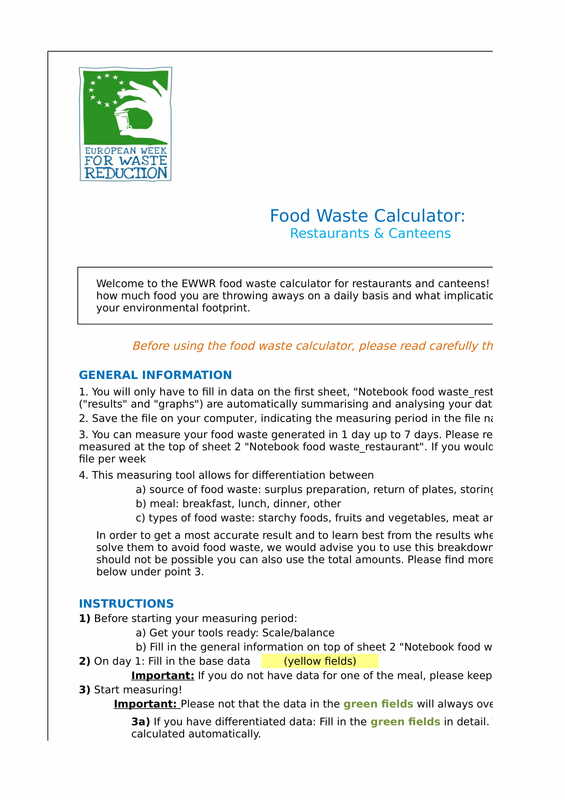 Although this form is not a direct financial document that caters numbers and prices, it is significant for determining the equivalence of the restaurant’s waste when sold or converted into a profitable material. The form contains the approximate weights of the recyclable wastes, types of wastes collected, and the specific staff or group who were able to collect the wastes. Aside from knowing the values of the wastes, the form also aids in acknowledging who among the staff is good at promoting waste reduction and must be awarded for the deed that he did in helping the restaurant and the environment. You may also see restaurant performance forms. When building a new restaurant establishment, an owner must not focus only on how to prepare an effective restaurant marketing strategy since there are other relevant details that need to be tackled during the construction phase of the business. One subject that must also be centered is how the waste of the renovation and construction be handled. This is why restaurant owners need to complete a business waste management plan form. This document is used along with demolition forms and documents that relates to building the restaurant. The form will cater the applicant’s information who is the restaurant owner who applied for construction and demolition permits, the outline of the restaurant proposal, a statement of compliance of the plan, a statement of declaration, and the various building stages that the restaurant owner needs to consider with his contractor. The first stage section is for gathering details about the demolition materials and the waste. On the other hand, the second stage section is for waste minimization and management plans of the restaurant owner during the construction of his restaurant. 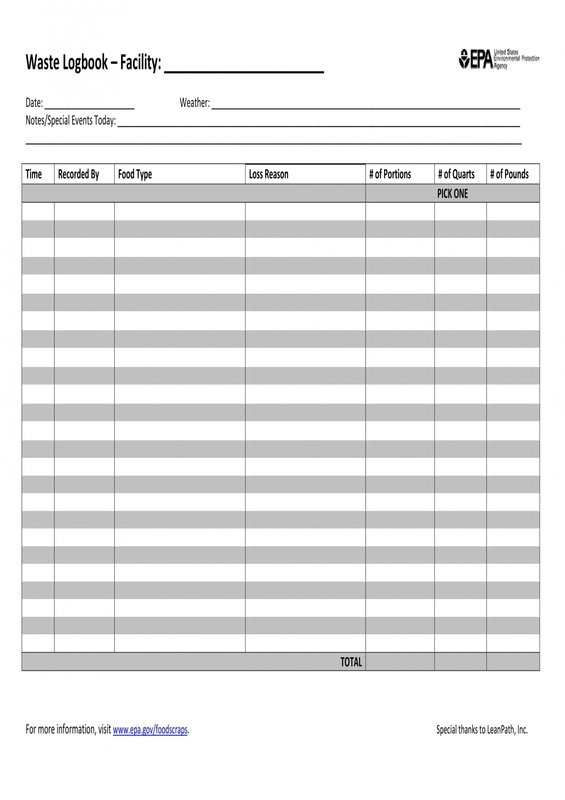 You may also like restaurant plan forms. Compared to the aforementioned documents, this form is not targeted to be used by any restaurant staff but by the authorities of the state or the government. A food waste establishment inspection report form should be completed by an authorized inspector on a regular basis. This is for determining if the restaurant business and establishment have met and complied with the state’s food service regulations. Aspects to be inspected include the restaurant’s supervision and awareness toward food-borne illnesses, diseases, and public health interventions. The retail practices of the restaurant along with their temperature observations and planned corrective actions are also necessary to complete the form. The input of the inspector will then be assessed and analyzed as part of the licensing and certification process for the business. 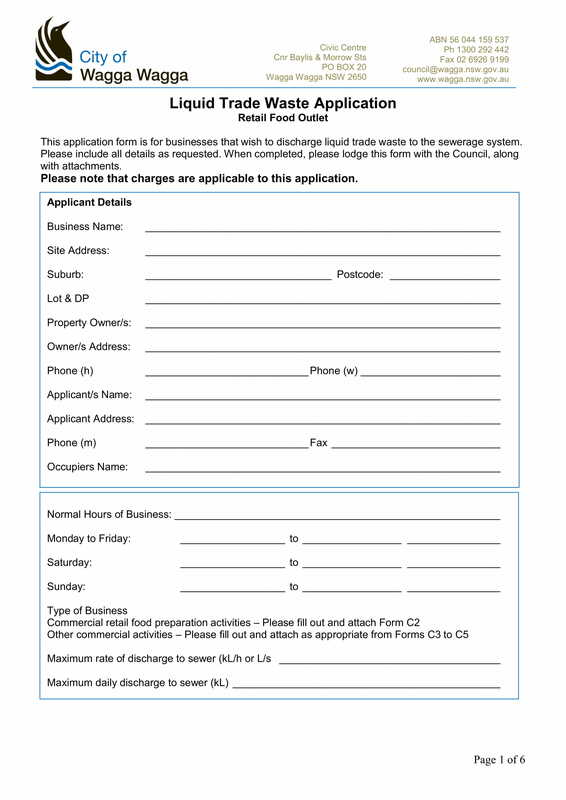 Before a restaurant business can discharge their liquid waste to the sewerage system of a state or country, a type of restaurant application form must be completed by the restaurant owner. Specifically, a restaurant waste discharge application form is needed to be filled out by the owner with his personal information, contact details, and his restaurant business details. The restaurant’s business hours schedule and the maximum number of discharge wastes must be indicated on the form to inform the authority of when they must conduct a maintenance for the used sewerage system. In addition, a policy that serves as a general agreement that highlights the terms and conditions of the state regarding the sewerage system usage of the restaurant business is also enclosed on the form to allow the restaurant owner be knowledgeable about the rules associated with his discharge application. 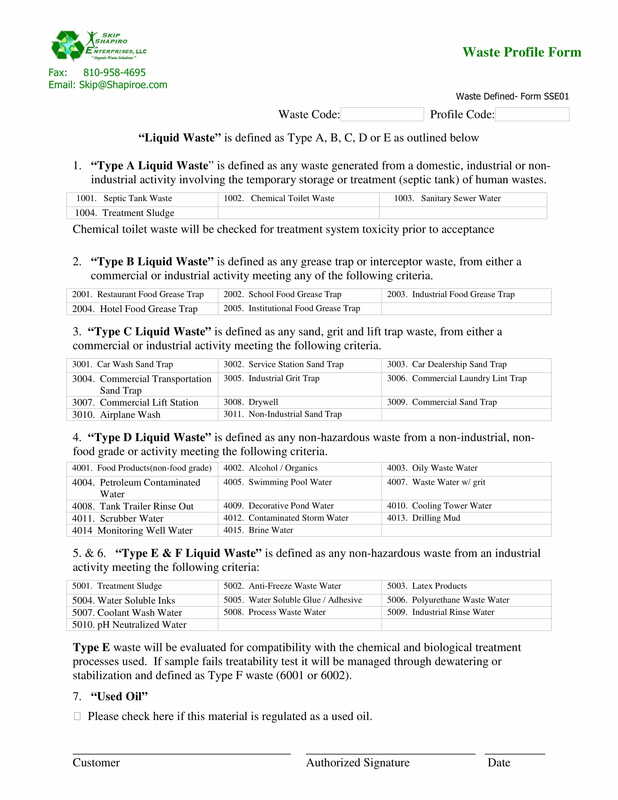 Determining the types of liquid wastes that a restaurant business will discharge is the purpose of using a restaurant waste profile form. Basically, the document has sections that allow the user or the restaurant owner to list and describe each waste in a category. The succeeding section of the form will cater details regarding where the wastes are generated as well as to whom the invoice forms are sent after the waste generators do their obligations. The last section of the form centers on a generator certification, which is essential for acknowledging that the wastes are regularly generated and that varying wastes are being categorized into groups upon discharging and proceeding to the generating process. To complete the form, the business’s chosen generator must affix his signature on the space below the certification along with the date of when the completed the document. You may also check out restaurant contract forms. 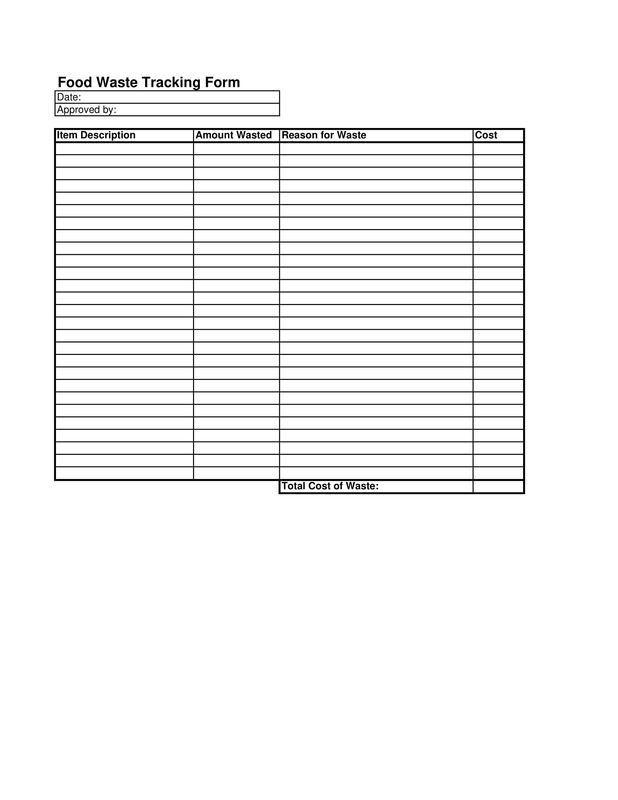 Creating a restaurant waste tracking form is an easy task for any restaurant owner. The first thing to consider when making this form is to choose what format will be effective and appropriate for the staff of the business. This refers to whether the owner will make a form in a portable document file (PDF) format, in a word document format, or print it out into a physical form to allow everyone have a copy of their own tracking form. After determining the format, the owner must indicate the name of his restaurant along with the logo at the top of the form to state a header for the document. Then, an area allotted for the date of when the form is completed, submitted, and approved must follow the header. With this, the owner will have the place a table that contains four columns and a minimum of ten rows. The first column is allotted for the item description of the waste which will be followed by the amount wasted on the second column. On the other hand, the third and fourth columns are for the reasons of the waste and actual costs for each wasted item. Once the table is created, the bottom part should be labeled as “total costs” to indicate an area where the restaurant management staff will state the summed up amount of every wasted material. If the form is in a portable document format, the owner must connect the link of the document to the database system of the restaurant. This will allow the management to acquire the entries of the user immediately after the user submits the form. If the form is in a word document format, the owner can indicate the management’s email address to allow the user in knowing where he will be sending the document once he filled everything out. Lastly, if the form is printed and handed to the user, the owner should assign a person who will be responsible for collecting the tracking form and document it along with the other submitted forms. This will aid in the record-keeping aspect of the business especially when the authorities will demand the representation of the tracking forms for determining the waste management appropriateness of the restaurant business. You may also see restaurant tax forms. Why Are Restaurant Waste Forms Significant? Aside from documenting wasted products, food, drinks, and even kitchen supplies, restaurant waste forms will aid any restaurant owner toward efficient business planning. With the form, the owner will know what dishes are mostly not finished by his clients and are thrown away by his staff identical to using a restaurant survey document. Limiting portion sizes as well as deleting the dish from the restaurant menu can be some of the options that the owner can choose from once he knows the statistical outcome relating to his business’s wastes. 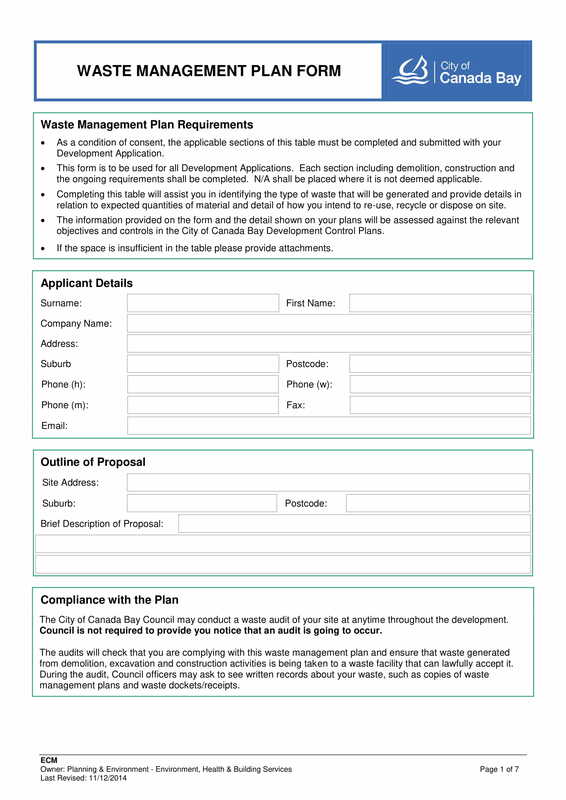 Along with the restaurant waste form, restaurant owners must also use other documents for running his business. This includes restaurant order forms for their clients who order in bulk, waiver forms for his staff during activities and events, and even kitchen management forms for his chef to maintain and manage the kitchen. Nonetheless, all of these forms must be kept as part of the documentation of the business to assure that the progress, as well as the changes, are recorded efficiently.